Best Massage Chair Reviews: Human Touch vs Osaki, etc. Wouldn’t it be nice to come home to a massage after a long day at work? These chairs aren’t the cheapest, but as Tom and Donna from Parks and Recreation would say, “Treat yo’ self.” It may be a larger upfront cost but when you think about it, the average cost of a massage is $60/hour so that can add up fast, especially once you add in the cost of gas! 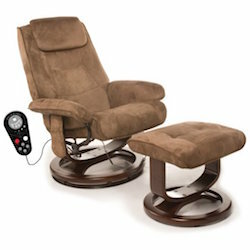 You probably aren’t treating yourself to these daily at that price, but you could be if you had your own massage chair. Some of the companies we reviewed offer multiple chairs so to lessen the confusion, we tried to choose the model that we thought was the most popular. We then chose the top four that we thought were best based on price, quality, massage comfort and techniques. Read our massage chair reviews below to see which one will have you relaxing in no time (or literally tomorrow with those offering Amazon Prime shipping)! The iJoy 2580 Robotic Massage Chair is one of Human Touch’s most popular models. It relaxes your core areas and has won several awards. There are other models offered by Human Touch, so if you’re looking for a variation on our top pick, be sure to check out their other products. Osaki offers various models, all specializing in different things. For this review, we focused on the Osaki OS-4000 Zero Gravity Shiatsu Massage Chair which came in 2nd place for best massage chair. This chair works on nearly every part of your body. It uses vibration, air massage, rolling and heat therapy to relax your body. This chair is very large, which is not uncommon for most massage chairs but know that you will need more space than a typical recliner would need. T & D Enterprises’ BT-7672-MASSAGE-BK-GG Massaging Black Leather Recliner and Ottoman is another one of Amazon’s best-selling chairs. It focuses on 4 zones: upper back, lower back, thighs and calves. So if you’re looking for a cheaper product with fewer features but still more than a regular lounge chair this is a good option. Comfort Products’ 60-078011 Deluxe Leisure Recliner Chair is made of micro-suede and is one of Amazon’s best-selling chairs. It’s best for smallf to mid-sized people (they recommend 5′ 10″ and shorter). It has 8 vibration motors to work on 4 massage zones: upper back, lower back, thighs and calves. This chair has an ottoman to work the calves. It’s very similar to the one offered by T&D Enterprises. Having your back rubbed is nice and all, but what about your feet? If your dogs are barking, check out these foot massage machines which you can use in tandem with your massage chair. And if you have back pain, you might also consider doing yoga to help stretch and improve your flexibility. Why do you want a massage chair and which one do you want most? Massage chair gives us so much of benefits.My grandfather is also using massage chair at home.After using massage chair,now my grander father is feeling so relaxed. Great glad to hear it’s been beneficial to your grandfather! Thanks for sharing. I’ve been experiencing MAJOR neck and back pain recently from my desk chair. Since I spend most of my day sitting in an office where I can’t use one of these chairs, coming home to get a massage from one of these I think is a very worthwhile investment. And will pay for itself in the amount of money I’ll save at the chiropractor!